North Korea on Wednesday showed off what it claims is a miniaturized nuclear weapon and a purported diagram of a nuclear warhead that can be mounted on an intercontinental ballistic missile. The Defense Ministry here said it is unlikely that the North really has the wherewithal to miniaturize nuclear warheads, but some experts warn that it is at least on the way. The official Rodong Sinmun daily quoted North Korean leader Kim Jong-un as saying, "The nuclear warheads have been standardized to be fit for ballistic missiles by miniaturizing them" alongside pictures of a round silver object and several missiles. It was the first time Kim has commented on the renegade country's ability to make a nuclear warhead small enough to fit on a missile. North Korean leader Kim Jong-un instructs officials in this photo published in the Rodong Sinmun daily on Wednesday. North Korea has conducted around 130 detonation tests from the 1980s until the 2000s to develop a trigger that could be used on a warhead. The detonator revealed Wednesday measures 60 to 80 cm. There are around 70 hexagonal shapes on its surface, which are believed to be high-explosive charges called lenses. They would detonate simultaneously to create a high-pressure environment that triggers a nuclear explosion. "The more lenses there are, the more uniformly nuclear material can be compressed to induce an effective nuclear explosion," said Lee Choon-geun at the Science and Technology Policy Institute. "If the detonator is genuine, it is probably very sophisticated and means that the North has succeeded to some degree in miniaturizing a nuclear weapon." When China conducted its first nuclear test in 1964, there were only around 30 lenses, which means North Korea's technology could be superior to China's during the infant stage of nuclear development. The KN-08 ICBM has a range of 9,000 km to 12,000 km, but a nuclear warhead must be 60 cm in diameter and weigh less than 500 kg, so the detonator the North unveiled may be too large. But to be compatible with a Scud missile, which has a range of 300-700 km and could strike anywhere in South Korea, the warhead can be 88 cm in diameter and weigh up to a ton. A warhead for a Rodong missile can have a diameter of 1 m and weigh less than 700 kg. 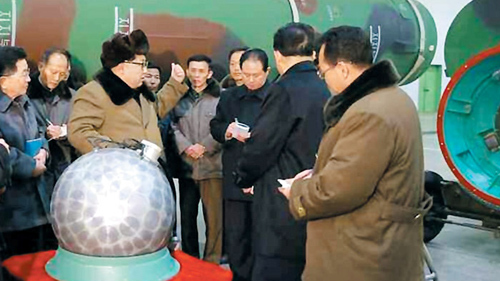 The paper also printed a photo of Kim standing in front of a blurred diagram of the purported warhead, which consists of circular and semi-circular objects. Lee at the institute said, "If the semi-circular objects are nuclear materials, that could be a hydrogen bomb." Pundits guess that Kim is showing off the warhead, whether genuine or not, mostly for domestic purposes as a big party congress looms in May and North Koreans are nervous about tighter international sanctions. One military source here said, "If the claim is genuine, we need to hurry to come up with an effective nuclear deterrent and leave all possibilities open, including building the capability to launch preemptive strikes and homegrown missile defense system as well as deploying U.S. tactical nuclear weapons.